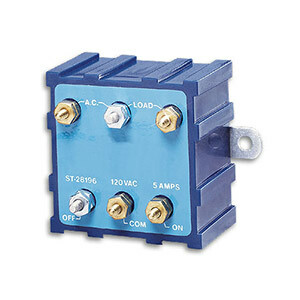 The SSRL series are latching 5 amp SPST Normally Open relays with a small output current to sense the closing of up to two dry mechanical relay contacts. They are ideal for differential level control for pump-up or pump-down applications when combined with any two level switches with dry relay contact closures, such as 2 LV-10 switches or 2 LV-230 switches, for example. The SSRL relays also convert non-latching mechanic relay outputs into latching alarm outputs, or allow low power reed relay switches to control high amperage or high voltage devices, such as pumps or motors. Latching operation is reset by making a momentary contact between the COM and OFF terminals. The SSRL holds its operational state for up to 1/2 second during momentary power loss to avoid nuisance shutdowns. A short between the COM and OFF terminals shuts the relay off, regardless of the switch status at the ON terminal. 참고: The SSRL Series Relays are not failsafe; we recommend a third level switch independent of the SSRL for alarm of overfill or overdrain conditions.